Recently while working as a podiatrist I had a patient come to me regarding the fungal infection of her toenails, she was deeply frustrated as she couldn’t wear open toed shoes during the summer. With my guidance, this particular patient was able to leave my care knowing the steps she would need to take to address the problem. So how is a fungal infection caused and what is it do you need to look for when you suspect that you yourself have an infection keep reading to find out! 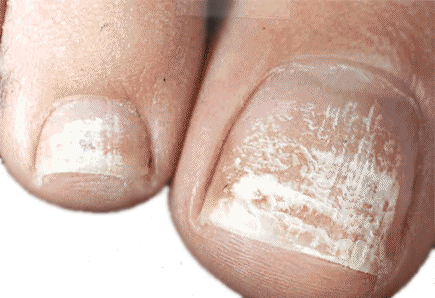 A fungal infection of the nails otherwise referred to as onychomycosis, is when the nail bed ,plate or surface is infected by over-growth of fungus particularly in hot and humid conditions such as in shoes or communal showers and pools. The trouble with a fungal nail infection is that, there are commonly four types of fungal nail infection that you can be affected by, thus it is easier if we discuss the symptoms of each type separately. If you have any of the symptoms mentioned, then you may have some form of a fungal nail infection. If you have any concerns or queries please book an appointment with one of the podiatrists at PodiatryHQ at your preference for an assessment of your nails and management options.